One Bite, Part 18 | The planting dance! - Perelandra Ltd.
Plus some tips and reminders. It's that time! You've been preparing for this day for weeks and months. Now it's here . . . Planting Day! By the way, we don't literally mean today. We know you've gotten your planting schedule from nature and we want you to follow that. 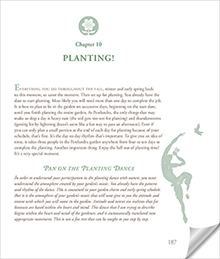 When your planting day arrives, this inspiration from nature, plus Machaelle's instructions and our added tips, will make these days in your garden easy and joyful. 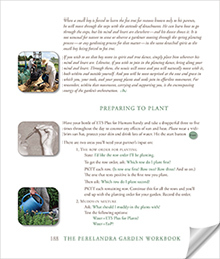 Now, or a few days before you start planting, read pages 187-191 in The Perelandra Garden Workbook. Hint #1: Make a copy of these pages or print them from your ebook, and put your pages in plastic sheet protectors. This way, you can carry them with you into the garden along with your garden layout charts. Hint #2: A clipboard is mighty handy for keeping your papers in order. Before Planting Day: What do you need? Will you need trellises, tripods or other plant supports? It's easier on the plants (and you) to have those in place now. - If you haven't already, ask nature if you are to add anything to the water you'll be using to "muddy in" after planting. See the instructions on pages 188-189. - Arrange them by section and row in trays. You'll be glad you did. - Just take the trays you need to the section you're working in and dig in. Leave the other trays in the shade until you need them. 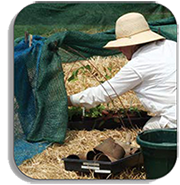 - Put seed packs in sealed plastic bags before you put them in the tray to keep them dry. - From your kitchen utensil drawer is fine. It just needs to be clean! 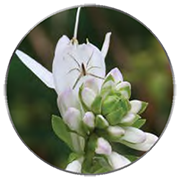 At the end of each planting day, give your plants and seeds the added support of Essence of Perelandra. See page 190. Thank your partner and hit the stop button before you head inside. Now for you, Gardener Extraordinaire! Remember to dress to prevent sunburn and keep the ticks off. Be sure you've got a healthy sunscreen, a good sun hat, light cotton long sleeves, light (preferably white) pants to reflect the sun and to deter ticks. To keep those buggers from easily crawling up your leg, tuck your pant legs into white socks. You'll look smart as far as we're concerned! Have plenty of drinking water nearby and remember to drink it. We also keep plenty of fruit popsicles in the freezer for popsicle breaks on planting days. Keep ETS for Humans with you and take it through the day to alleviate the effects of sun and heat, or for the effects of all that kneeling and squatting for those who are old enough to understand what we mean by that! You should already be taking Bites and Stings at least once daily. And if you are particularly at risk to tick bites and other parasites, include the Human Internal Parasites and Human External Parasites in your daily routine.